Faculty of Computer Science (Fasilkom) of Universitas Indonesia (UI) cooperated with GNU/Linux Bogor Community (GliB) held an international conference on information technology called “GNOME.Asia Summit 2015”, on May 8th to 9th 2015 at Balairung UI, Depok. The conference met domestic and overseas IT experts and academics, government representatives, and students to discuss and knowledge sharing about technology innovation, especially about GNU/Linux technology and its applications. The main discussion of GNOME.Asia Summit 2015 was related to GNOME as desktop environment which is designed by open source for Linux operationg system. Opening ceremony of GNOME.Asia Summit 2015 was held on Friday, May 8th 2015, 09.00 am West Indonesian Time at Balairung UI. 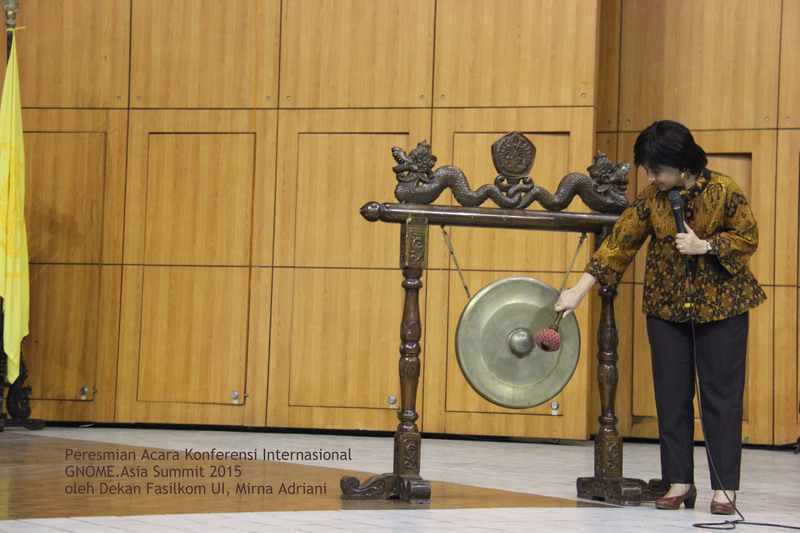 Opened by the Dean of Fasilkom UI, Dra. Mirna Adriani, Ph.D., the conference also invited Aidil Chendramata (Director of Information Security of Ministry of Communication and Informatics of Indonesia) as main speaker, Mohammad Anwari (The Architecture of BlankOn Linux), dan Tobias Mueller (GNOME Board). Besides Tobias Mueller, other GNOME representatives such as David King and Ekaterina Gerasimova also came to introduce GNOME and its procedures in Indonesia. GNOME.Asia Summit 2015 was not only involved students or visitors from Indonesia, but also from other countries such as Britain, Germany, Czech Republic, Australia, Taiwan, France, China, Singapore and Peru. In two days, the conference was held from 9.00 am to 5.00 pm West Indonesian Time with the series of event that was consisted of workshop, IT Expo, Lightning Talks, and Parallel Session. On Saturday, May 9th 2015, David King gave speech about design and tab meno on GNOME. Philosophically, GNOME carrying an atmosphere which is accessible and usable for anyone, also underlining freedom as one of the core values of GNOME. The next speech was given by Ekaterina Gerasimova who talked about GNOME Foundation. GNOME Foundation which is consists of jobholders and volunteers, established since 2000 to help the development of GNOME communities. Now, the recent version of GNOME 3, which is GNOME 3.16, has been released after being developed for 6 months by GNOME Project.